Hungary's right-wing government has since said it will not sign the final document at a ceremony in Morocco in December. Poland, which has also clashed with Brussels by resisting national quotas for asylum seekers, has said it is considering the same step. "Austria will not join the U.N. migration pact," said Chancellor Sebastian Kurz, a conservative and immigration hard-liner who governs in coalition with the far-right Freedom Party. "We view some points of the migration pact very critically, such as the mixing up of seeking protection with labour migration," said Kurz, who argues that migrants rescued in the Mediterranean should not be brought straight to Europe. Vienna currently holds the rotating presidency of the European Union and its decision to back out of the pact now further demonstrates the fraying of unity in the 28-nation bloc over the politically fraught issue of migration. Freedom Party head and Vice Chancellor Heinz-Christian Strache said Austria was concerned that the pact, though non-binding, could lead one day to a recognition of migration as a human right. "We reject any movement in that direction," Strache told a news conference after a cabinet meeting. That experience dominated last year's parliamentary election and helped propel Kurz's conservatives to power. He has said he will prevent any repeat of that influx and has implemented policies that include restricting benefits for new immigrants. U.N. officials in Geneva had no immediate comment on Vienna's decision. 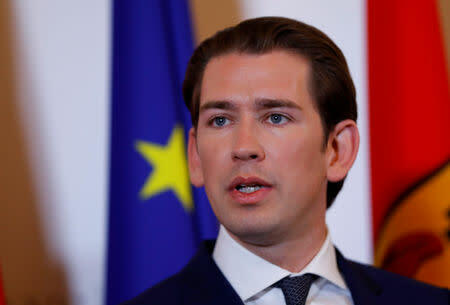 Austria will not send an envoy to the signing ceremony in Morocco and will abstain at a U.N. General Assembly vote on the pact next year, Kurz's office said. In a paper this month, the Brookings Institution, a U.S. think-tank, said the pact "reflects widespread recognition, among even the most sceptical member states, that managing migration effectively is in the common interest". It said the deal could have far-reaching implication for more than 250 million people outside their own countries, as well as the communities that host them, but would depend greatly on implementation at the municipal level.